Welcome to the Royal York Animal Hospital’s new website! 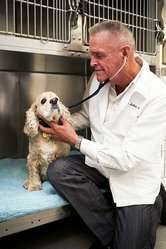 I am Dr. John Allen (Dr. John) and am one of six veterinarians and a team of 40 veterinary medical professionals here to help you with all of your pet’s needs. Check out our “team” pages to read all about our staff. Most have been at Royal York Animal Hospital for many years and are a great testament to the fact that it is a great place to work and to bring your pet. The other vets here are Dr. Dawn Brown, Dr. Annelle Valentin, Dr. Suzie Jerabek, Dr. Luisa Alvarez and Dr. Iz Jakubowski. I have been an associate veterinarian since 1998. We do our best to keep you, the client, informed of the latest in veterinary medical advancements. So, let me tell you a little bit about us! Royal York is a full service dog and cat hospital, open 7 days a week…….7am to 9pm weekdays and 8am to 5pm both Saturday and Sunday. We also have complete grooming and boarding facilities available for both cats and dogs. We are located on Dundas Street West just east of Royal York Road in Etobicoke (West Toronto) New patients are always welcome! Come by for a tour of our facilities any time! We recommend annual examinations for healthy adult pets where we concentrate on individualized preventive care. If your pet is “mature” exams every six months will be recommended. If your pet is unwell, injured or in an emergency situation, our on site facility includes a sophisticated laboratory for immediate blood and urine test results. Our state of the art digital radiography provides instant imaging. Xrays are an important diagnostic tool to understand why your pet is sick or how extensive injuries are. In our surgery suite we perform many types of sterile surgeries from spays and neuters to exploratories and orthepedics. Your pet’s comfort and safety is our priority. Our medical staff takes the time to get to know you and your pet and we will customize your pet’s pain management and nursing care. I will be blogging about community and hospital events as well as “in the news” items in veterinary medicine. If you have an idea or question you would like answered in my blog please email the hospital at royalyorkvets@ryah.ca……I would love to hear your ideas! Dr. John.